Attractive and entertaining game board promoting an adventure radio serial. 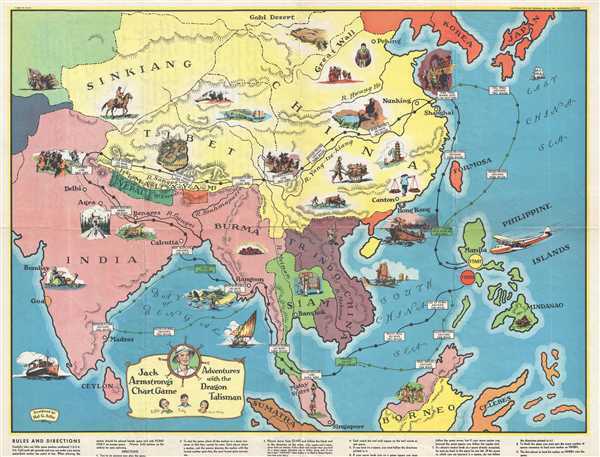 This is a 1936 Hal G. Arbo fantasy map of Jack Armstrong's adventures through Asia. The map depicts Asia from India to Japan and the Philippines and from the Mongolia and the Gobi Desert to Sri Lanka, Singapore, and Indonesia (Borneo and Celebes). As this is a game, a circular route both begins and end in Manila, in the Philippines. Along the route, 'events' take place, either aiding or hindering the player in their journey. For example, one box reads, 'Tiger Tong Warns Jack, Lose Next Turn', or 'Captured Plane; Take Extra Turn'. Scenes 'encountered' along the journey also dot the map, including the Great Wall of China, the Taj Mahal, a tiger standing over a fresh kill, and an elephant dressed in brightly colored fabric. Sea-going vessels of all kinds ring the continent, from large ocean liners to Chinese junks. Numerous cities are labeled, including Shanghai, Hong Kong, Delhi, Calcutta, Bangkok, and Singapore. Jack Armstrong, 'The All-American Boy', was the eponymous hero of a radio adventure series. The series ran from 1933 to 1951, and included his friends Billy and Betty Fairfield. Created by General Mills to promote Wheaties, several contests were conducted throughout the show's run, one of which included the 'premium' give away of this game board. In 1936, Jack and his friends set off on the China Clipper for Shanghai to meet up with Uncle Jim Fairfield. Jack was carrying a jade talisman from a friend of Uncle Jim's. While there, someone tried to steal it from him, only to lose a dragon talisman he was carrying. The dragon talisman (which is depicted on this game board) held the clue to an ancient city buried beneath the Gobi Desert. This game board was designed by Hal G. Arbo and published by General Mills in 1936 as a premium available to listeners of the Jack Armstrong radio show.